Well, they have certainly caught my attention and I am very intrigued by their diet. So What Exactly is a Fruitarian? You likely already know what a vegan or vegetarian is. And as you have probably already guessed, a fruitarian is someone who sticks to eating fruit. But there is actually so much more to it than that. There are varying definitions on what exactly makes a person a fruitarian - meaning some standards for what qualifies a person as a fruitarian are more strict than others. But the basics are that a fruitarian’s diet should consist of at least 75% fruit and 25% nuts and seeds. “Though some fruitarians are more flexible than others, the diet typically revolves around the seven basic fruit groups. These include: acid fruits (citrus, pineapples, cranberries); subacid fruits (sweet cherries, raspberries, figs); sweet fruits (bananas, melons, and grapes); nuts (hazelnuts, pistachios, cashews); seeds (sunflower, squash, pumpkin); oily fruits (avocados, coconuts, olives); and dried fruits (dates, prunes, raisins),” according to this U.S. News report. “It’s considered a subset of raw veganism,” says one source. Some fruitarians believe you should only eat fruits that have fallen from a tree (yes, fallen, not picked). “Those who latch on are often propelled by a desire not to kill anything, including plants. The regimen comes with a rich history: Leonardo da Vinci was a fruitarian, and Mahatma Gandhi followed the plan for six months in the early 1900s,” according to the U.S. News report. Reportedly, Apple founder Steve Jobs was fascinated by fruitarianism and followed this way of eating at times, saying it fueled his creativity and inspired his company’s name. Actor Ashton Kutcher attempted to follow fruitarianism for a month in order to prepare for a movie role where he would play Jobs. "Our pancreas secretes insulin when carbohydrates are consumed," says Keri Gans, a registered dietician. "If all he was doing was eating fruit, he may have been overworking it." So clearly there are risks with following the fruitarianism way, but there are still many advocates of this diet. A quick #fruitarian search over social media channels will show a whole fruitarian tribe with thousands of followers. In an interview with CNN’s Dr. Sanjay Gupta, Michael Arnstein, a fruitarian athlete, says he eats 25 to 30 pounds of fruit a day (and little else). Arnstein is an endurance athlete and says being fruitarian helps him with performance. He eats 6,000 calories a day, with most of these calories obviously coming from fruit. 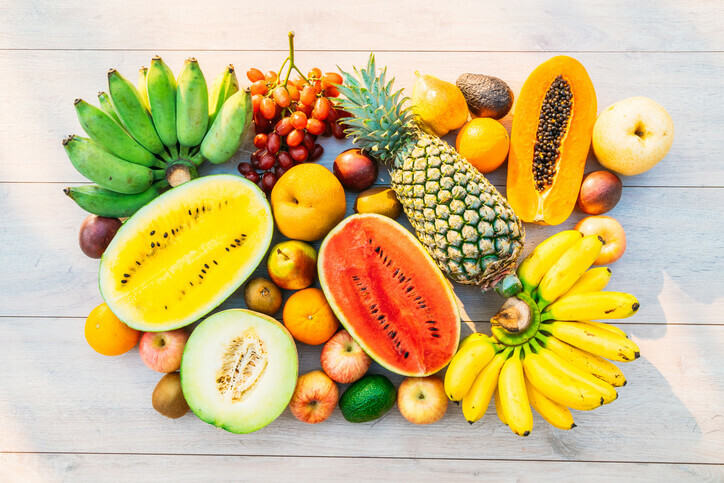 Although considered a healthy food, fruit is high in sugar, so eating this much fruit may not be recommended for someone who is prediabetic or diabetic. Fruits are delicious, whole, very nutrient-dense foods. To give you an example of how chock-full of nutrients, like vitamin C, vitamin A, calcium, folate and magnesium, fruits are, check out the nutritional value in just one serving of kiwi, grapefruit, star fruit, apricots, strawberries, peaches and jackfruit. Fruits are rich in antioxidants which help fight inflammation, a root cause of many diseases such as cancer and heart disease. A fruitarian diet is also low in saturated fat and rich in fiber. Fiber helps relieve constipation, soothe irritable bowel syndrome (IBS) and may even help prevent certain types of cancer, including colon cancer. On the flipside, what’s most concerning to me about a fruitarian diet is the high risk of having nutritional deficiencies. Your body needs six basic nutrients to live: water, protein, carbohydrates, fats, vitamins and minerals. As a fruitarian, you may not get the right balance of all the nutrients you need to stay healthy. Fruit is nutrient-dense, but you may still need other foods, like whole grains and legumes, in order to get the proper nourishment for your body. “Fruitarians frequently have low levels of vitamin B12, calcium, vitamin D, iodine and omega-3 fatty acids, which can lead to anemia, tiredness, lethargy and immune system dysfunction. Low calcium can also cause osteoporosis,” reports the Cleveland Clinic. And if you think supplementation is the answer, think again. I think a general rule of thumb is that you never want to be on a diet that is so restrictive that your health may suffer. Many of us already have some nutritional deficiencies and imbalances (whether it’s due to age, medications we may be taking and the fact that soil from which fruits and vegetables are grown is losing nutrient value). So why follow a way of eating that further adds to our risk of having nutrient imbalances? If you decide to be fruitarian, then I recommend taking periodic nutrient tests. These tests will identify any imbalances or deficiencies you may have. And if you have imbalances, work with a competent healthcare professional to adjust your diet and possibly recommend quality supplements.